The K810 Bluetooth keyboard is the latest in the line of Logitech’s Windows 8 certified keyboards. However, the K810 is not solely meant for use with a Windows 8 desktop PC. This compact, illuminated keyboard is capable of connecting to up to three devices simultaneously, be it the iOS operating iPad or an Android running smartphone or Windows 8 PC. Moreover, K810 can pair with three different devices simultaneously and it allows you to switch between these devices by just the press of three dedicated buttons – one for each device. 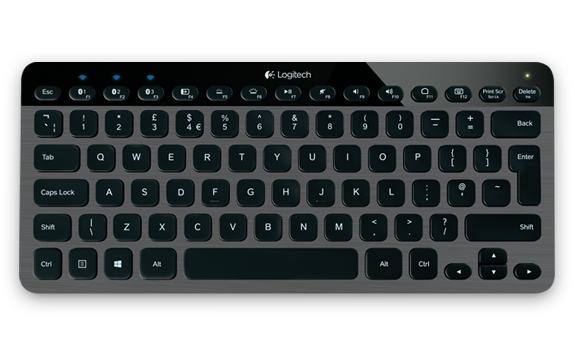 The other highlight of the Logitech K810 Bluetooth keyboard is the illuminated keys. This back lighting feature, however, goes further than regular keyboard illumination. The keyboard comes with ambient light sensor, which means the back light brightens or dims accordingly. The keyboard also sports a proximity sensor, that turns on the back lighting automatically as your hands come close to the keyboard. Being a Windows 8 certified keyboard, it had to had some specific features. Logitech has added a dedicated function key for switching apps in Windows 8. The K810 comes with a rechargeable battery that provides 10 hours of backup on a full charge under standard conditions. Also, the battery can be charged via USB, which makes it possible to use the keyboard even while it is charging. The Logitech K810 Illuminated Bluetooth keyboard will be available in the U.S. starting from later this month for $99.99 and in Europe from November for a price of £89.99. More information and images of the keyboard can be found from the source link.